USC follows Associated Press Style for its print and online communication to the public. In some cases, the university has its own style for certain uses, such as memos, letters and academic publications. If you don’t find your issue addressed below, assume that we follow AP Style. You may find frequent updates for AP Style through Twitter at @apstylebook. Members of the USC community on USC IP addresses have free access to AP Style online through USC Libraries. Away from USC’s campuses, you may connect via USC’s VPN. If the AP style guide doesn’t help, refer to the Oxford American Dictionaries or Merriam-Webster. Acronyms may be used on second reference but try to use “the center,” “the institute” or simply a shortened version of the center or institute’s name if possible. Example: Sandy made a donation to USC Shoah Foundation — The Institute for Visual History and Education. At the institute’s annual gala, she was honored with the Donor of the Year award. Academic degrees should be written without periods: BA, MA, MSW, PhD, EdD, PharmD. Do not use “Dr.” before a name, even in a medical context. When denoting an alumnus’ degrees, include only the graduating year for a bachelor’s degree – no BA or BS. Examples: She received her BA from the USC Gould School of Law. Jane Doe MA ’12, PhD ’12 is currently serving as executive director of Alpha Academy. Sally Smith ’13 joined the Peace Corps. For joint degrees, such as the ones at USC Gould School of Law, use a slash between the degrees. Also and already — For adverbs “also” and “already,” they should be placed like so: He has also been to France, not He also has been to France; She has already earned her degree, not She already has earned her degree. Sherrie says, NOT says Sherrie — Use the latter only when a description of the individual follows the name. Example: … says Sherrie, a fourth-year graduate student at the USC Roski School of Art and Design. For official names of USC trustees, go to the Trustees site. Bovard Auditorium is a room within Bovard Administration Building. If there is a phrase or word inserted by the editor in someone’s direct quote, use brackets. Example: He said his team (the Los Angeles Dodgers) might win the pennant. On first reference it is the Bridge Institute at the USC Michelson Center for Convergent Bioscience (or the USC Michelson Center for Convergent Bioscience Bridge Institute). See also USC Michelson Center for Convergent Bioscience. In a sentence with a colon, capitalize the first word of the phrase that follows if it is a complete sentence. If it’s a fragment, the first word is lowercase. Example: The school said “thank you” by naming his old department after him: the Daniel J. Epstein Department of Industrial and Systems Engineering. The word “the” is not capitalized because what follows is not a complete sentence. In a sentence with a semicolon, the second clause is always a complete sentence and always begins with a lowercase letter. Titles preceding a full name should be capitalized. Titles following a full name should be lowercased. For specifics, see “Titles” entry in the style guide. Exceptions: President Emeritus, University Professor, University Archivist, Distinguished Professor, Provost Professor, Presidential Professor and named-chair titles are always capped — before and after a name. Capitalize “Move-in Day,” usually the Wednesday in August before classes begin. Follow AP style, which is to lowercase and write out numbers one to nine. Use figures for 10 and up. CEO is acceptable on first reference. Spell out chief operating officer on first reference. Example: CEO Jane Smith met with Chief Operating Officer Frank Jones. The USC-affiliated hospital’s name can be abbreviated CHLA, but never Children’s Hospital L.A.
It’s the Los Angeles Memorial Coliseum on first reference, the Coliseum thereafter. It will be renamed the United Airlines Memorial Coliseum in 2019 when the $315 million renovation project (formerly $270 million) is complete. The Coliseum is jointly owned by the state, the county and the city of Los Angeles, and is managed and operated by USC under a 98-year lease that extends through 2111. No serial commas. Use commas to separate elements in a series, but do not put a comma before the conjunction in a simple series. Example: There were green tents, blue tents and red tents on the lawn. Use a comma before the conjunction if it is necessary to prevent confusion. Example: There were green tents, blue tents, and red and white striped tents on the lawn. Use a comma after Washington, D.C.
Use commas to set off state and country names. Examples: They went to Arlington, Texas, to see friends. They visited Siuna, Nicaragua, with friends. Do not use commas to set off Jr. Examples: Edward P. Roski Jr., Martin Luther King Jr.
Do not use commas to set off Inc., Co., Ltd., LLC, PC or PLLC. A nonessential phrase must be set off from the rest of a sentence by commas. Example: Jeff released his first book, Twilight at USC, to rave reviews. The book title is nonessential because Jeff has only one first book — there is no confusion as to which book the sentence is referring. Example: Carla is survived by her brothers Randy and Jackson, niece, Lily, and nephew, Oliver. “Lily” and “Oliver” have been set off by commas because they are nonessential to the sentences — Carla has only one niece and one nephew, therefore there is no confusion regarding which niece and which nephew the sentence is referring to. Carla has more than one brother, which is why “Randy” and “Jackson” are not set off by commas. An essential phrase is not set off from the rest of a sentence by commas. Example: Jeff released his book Twilight at UCLA to rave reviews. The book title is essential to this sentence because Jeff has written more than one book, so the title isn’t set off by commas. Example: Larry and his wife, Lorna, went to the theater. Larry has only one wife, and therefore the name “Lorna” is nonessential in this sentence. If Larry had more than one wife, “Lorna” would become essential and would not be set off by commas. Contractions are encouraged in web copy. For specific questions about contractions to avoid, consult AP Style. Use em dashes rather than en dashes to set off phrases and indicate pauses. Always use a space on either side of an em dash. Example: He went to Westfield Mall — a mall in the middle of the city — to buy a phone. For ranges, use either en dashes or hyphens. Example: The festival will be held April 12–24. The festival will be held April 12-24. Use an ellipsis to indicate the deletion of one or more words in quotes, texts and documents. In general, treat an ellipsis as a three-letter word, constructed with three periods and two spaces. Leave one regular space on both sides of an ellipsis. Example: I … tried to do what was best. When using an ellipsis at the beginning or end of a sentence, add one more period. When a complete sentence precedes an ellipsis, place a period at the end of the sentence, followed by a regular space and an ellipsis. Lowercase, but Maymester is capitalized. Avoid “summer semester” because it’s not really a semester. The USC slogan may be capitalized or not, may include the exclamation point or not, and may be set off with quotes, depending on the specific usage. Her motto in the classroom is “Fight On,” something she learned to do as a USC student. “To them, ‘fight on’ means persevere when their family has no money for food, clothes or school supplies; ‘fight on’ means work long hours at an after-school job to help pay the bills; ‘fight on’ means strive for your dreams, even when no one in or outside of your community seems to believe in you. For almost a year, these students have drawn strength from ‘fight on,’ ” Rios said. When writing someone’s graduation year, make sure to use the proper backward-curling apostrophe (apostrophe and then hit the space bar) before the year. Example: Caroline Smith EdD ’60 launched an educational program targeting at-risk youths. Lowercase, even before a name: head coach Clay Helton. That’s how they do it on USCTrojans.com. Use hyphens in compound constructions when necessary to prevent confusion but not when the meaning is clear. Use a hyphen whenever ambiguity would result if it were omitted. Examples: He recovered his health. He re-covered the leaky roof. Always use hyphens for African-American, Asian-American, etc. Use hyphens or en dashes for ranges. For words that start with “co,” retain the hyphen when forming nouns, adjectives and verbs that indicate occupation or status. Do not use hyphens in other combinations. When a modifier that would be hyphenated before a noun occurs instead after a form of the verb “to be,” the hyphen usually must be retained to avoid confusion. Examples: The man is well-known. The woman is quick-witted. The children are soft-spoken. The play is second-rate. Email is written with no hyphen, but all other e- constructions take a hyphen. Except in direct quotes essential to the story, use “illegal” only to refer to an action, not a person. Lowercase in keeping with AP style change of June 1, 2016. Italicize stand-alone works such as book titles, movie titles, play titles, radio and television show titles (when referring to the series itself and not an individual episode), names of exhibitions, names of video games, album titles. Italicize foreign words and include the English translations in parentheses. Do not italicize commonly used foreign words that have been adopted into the English language. Set conference names and festival names in plain text with no italics. Set newspaper, magazine, journal and website names in roman (plain) text with no quotation marks. Generic musical forms such as titles are not italicized. If the title appears in a block of copy that’s already italicized (for example, in a listing giving directions to a venue), then the title is run in plain (roman) type to set it off. The USC trustee is married to Franklyn G. Kostlan ’56, MBA ’62, but at USC we don’t refer to her with his last name. See also USC Village. Example: Welcome to the Keck School of Medicine of USC. On first reference, the complete name of the entity must be spelled out. The phrase “of USC” may be deleted on second reference. As an option, later references may use generic phrases as long as the reference is clear in the context. The primary brand for use in clinical marketing is Keck Medicine of USC. Any reference to a service, an event or a physician in promotional materials/communications for patients and referring physicians should use Keck Medicine of USC. Do not use the one-word name “Keck” to refer to the medical school. You may use “the” in front of the name of the school. Examples: Welcome to the Keck School of Medicine of USC. Keck School of Medicine was established in 1885. The medical school’s total enrollment includes 701 medical students, 285 PhD students and 581 master’s students. The USC Norris Comprehensive Cancer Center is a part of the Keck School of Medicine of USC. Do not refer to “USC Norris” or simply “Norris” in writing as this may create confusion between the hospital and the cancer center. Examples: The USC Norris Comprehensive Cancer Center is one of the country’s original eight comprehensive cancer centers. The Norris cancer center is part of the Keck School of Medicine of USC, and it is affiliated with USC Norris Cancer Hospital. Do not use the one-word name “Keck” to refer to the medical center. Do use the article “the” in front of the medical center name in a sentence. Examples: The Keck Medical Center of USC is located on the university’s Health Sciences Campus, just east of downtown Los Angeles. The Keck Medical Center is home to two university-owned hospitals and more than 500 physicians. Do not use the article “the” before the name of the hospital. Examples: Keck Hospital of USC, formerly known as USC University Hospital, is part of the Keck Medical Center of USC. Keck Hospital is located on the university’s Health Sciences Campus. Note: Any correspondence or communication related to each hospital’s license or regulatory issues should refer to the specific hospital of concern. Second and later references: USC Norris Cancer Hospital. Do reference that the USC Norris Cancer Hospital is a part of the Keck Medical Center of USC. Do not refer to “USC Norris” or “Norris” in writing as this may create confusion between the hospital and the cancer center. Examples: USC Norris Cancer Hospital, a part of the Keck Medical Center of USC, is affiliated with the USC Norris Comprehensive Cancer Center. Examples: Keck Medicine of USC is the new name for the academic medical enterprise made up of the Keck School of Medicine of USC and the newly named Keck Medical Center of USC. Note: Keck Medicine of USC is an organizational concept, not a physical place. Examples: Patients are treated at the Keck Medical Center of USC, not at Keck Medicine of USC. Students enroll in the Keck School of Medicine of USC, not in Keck Medicine of USC. While the brand name “The Doctors of USC” will be visible in some applications, it will be retired in marketing activities in order to focus on the primary “Keck Medical Center of USC” brand, which includes the physician practices as well as the two university-owned hospitals. Spelled out on first reference; LAC+USC on subsequent references. No spaces around the plus sign. Los Angeles County+USC Medical Center isn’t part of Keck, but the doctors are Keck School doctors. L.A. Trade-Tech or LATTC on second reference. The community college down the road is part of the Los Angeles Community College District. Traveler, the (live) noble white horse, is the official USC mascot. 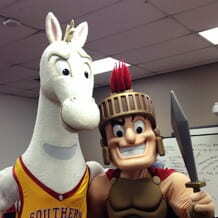 Tommy and Traveler, the costumed characters, are “mascots” but not the official USC mascot. Tommy and Traveler, the costumed characters, while not the official USC mascot, are “mascots” that appear primarily at basketball games but also selected other USC athletic events and other events outside of football. They are also used in certain sports media campaigns, i.e. ESPN Gameday commercials or the Capital One Mascot Challenge. Tommy Trojan (officially The Trojan Shrine) is a statue next to Bovard and is not the USC mascot. The person who rides Traveler at football games is a regal Trojan warrior. He is not Tommy Trojan. The USC Trojan Marching Band drum major, also dressed as a Trojan warrior, is also not Tommy Trojan. In keeping with AP style, use the Rev. before a name on first reference; when referring to a Catholic priest, be sure the context makes it clear he is a Catholic priest. Use the full name on first reference to the USC Viterbi department. For residential colleges, use full name on first reference and shortened name on second reference. Refer to the center’s web page for preferred wording. If USC is not part of the center’s preferred name, use the possessive. Again, if in doubt, refer to the institute or center’s web page. For names of schools and divisions, look in the Schools and Divisions section. In some cases, it’s uncertain if the company/group wants “the” capped in their name. Lowercase unless it is part of the company’s formal name. Refer to the company or group’s website for preferred wording. Do not use all caps in a name unless it’s an acronym. Do not use TM or R symbols in a company name. For faculty and staff names, check how the name is written on the individual’s school profile page. If a profile page isn’t available, check how the name is listed in the USC directory. Avoid using middle initials. Exceptions include senior administrators and trustees who prefer to use a middle initial; other individuals who express a strong preference for use of a middle initial; and cases in which omitting the initial would cause confusion. Example: USC Dornsife Dean Amber D. Miller (her personal preference). Always include the full names of board members, senior administrators and deans. Always include Nikias’ full name on first reference — C. L. Max Nikias. Do not break “C.” and “L.” on two lines. When people have initials in their names, use periods with no spaces between the initials. The sole exception is USC President C. L. Max Nikias. Use a space between his initials. Do not use commas to set off Jr., Sr., etc. Example: Martin Luther King Jr.
Former USC Pacific Asia Museum Director Christina Yu Yu goes by the last name Yu on second reference. USC school names — On first reference, write out the school’s full name. On second reference, use either USC Dornsife or USC Dornsife College. Other school names — Make sure to use the full name on first reference. Examples: Harvard University; University of North Carolina at Chapel Hill; California State University, Los Angeles; University of California, Berkeley. Cal Poly Pomona is acceptable on all references to California State Polytechnic University, Pomona. Caltech is acceptable on all references to California Institute of Technology. UCLA is acceptable on all references to the University of California, Los Angeles. Short names (“Stanford” instead of Stanford University, “Arizona State” instead of Arizona State University) are acceptable on first reference in sports stories. If in doubt, refer to the school’s website for preferred wording. Commas set off the specific location of the institution. Example: California State University, Long Beach, and University of California, Irvine, are two schools in Southern California. Examples: He was traveling from Nashville, Tenn., to Austin, Texas, en route to his home in Albuquerque, N.M. She said Cook County, Ill., was Mayor Daley’s stronghold. Follow AP style, which is to write out the numbers one to nine and use figures for 10 and up. Use figures when referring to age. Example: At age 5, she learned to read. Use figures for percent and percentages. Examples: Nicole made 5 percent less than last year’s total. The stock fell 15 percentage points over the course of three months. Use figures for dollar amounts and measurements. The phrase is hyphenated. As a title before her name, it is “USC President-elect Carol L. Folt.” Her husband is David Peart; he should not be called “first gentleman” or anything like that. Put quotation marks around smaller components within stand-alone works, such as book chapters, titles of articles in academic journals or magazines, individual television show/series episodes, song titles, classes, fairy tales, names of seminars, titles of works of art, poem titles, lecture and speech titles. Set conference names and festival names in roman (plain) text with no quotation marks. Set newspaper, magazine, journal and website names in roman (plain) text with no quotation marks. Quotation marks go inside colons and semicolons. Quotation marks go outside commas, periods and exclamation marks. For USC News stories, use single quotation marks in headlines and <h2> subheads; use double quotation marks in decks (excerpts). African-American, black, white, Latino and Hispanic are all acceptable. Respect an individual’s preferred term if a preference is expressed. Examples: She taught African-American studies. Irish-Americans voted in large numbers. As of Jan. 1, 2019, it’s no longer a Radisson. See USC Hotel. Capitalize titles like Rhodes Scholar, Rhodes Scholarship, Truman Scholar, Truman Scholarship. Use smart (curly) quotation marks and smart (curly) apostrophes. Examples: “Don’t go there,” she said. For USC News, USC Trojan Family Magazine and press releases, lowercase subheads. For USC News, use present tense for heds and decks. Use past tense for text. For the USC Trojan Family Magazine, use present tense throughout. Theater, not theatre. However, the formal names of all on-campus theater buildings are spelled -tre (Bing Theatre, Norris Cinema Theatre, etc.). Per AP style, titles are capitalized when they precede the name but not when they follow the name. When titles are long, avoid overcapitalization by placing the title after the name. President Emeritus, University Professor, University Archivist, Distinguished Professor, Provost Professor, Presidential Professor and named-chair titles are always capped — before and after a name. The building on the University Park Campus is Town and Gown. The organization is Town & Gown of USC on first reference, Town & Gown on subsequent references. Use this full name on first reference. On subsequent references, it’s the USC Ginsburg Institute. Use this full name on first reference to the facility, which is run by USC Student Health. Use this full name on first reference. The program should be identified as is a joint program of the USC School of Cinematic Arts’ Interactive Media & Games Division and the USC Viterbi School of Engineering. The former Radisson was rebranded as the USC Hotel on Jan. 1, 2019; note that “the” is not part of its name. Built in 1974, the hotel was initially managed by Hilton Hotels, later becoming a Crowne Plaza and a Radisson. USC purchased it in 2000. The entity is Michelson Center for Convergent Bioscience (USC Michelson Center on subsequent reference. Formerly the Seeley G. Mudd Estate. The art and design school is the USC Roski School of Art and Design on first reference, and the USC Roski School thereafter. The eye institute is the USC Gayle and Edward Roski Eye Institute on first reference, and the Roski Eye Institute thereafter. Do not use “USC Roski” to avoid confusion between the art school and the eye institute. The entity that runs the USC Engemann Student Health Center and other student health services. The formal name of the 32-story building at 1150 S. Olive St. (briefly known as USC Center). Designed by noted architect William Pereira and completed in 1965, it was formerly known as the AT&T Center (and the Transamerica Building before that). It houses a variety of USC offices, along with other tenants. Never “the USC Village.” If you just say “the village,” then “village” is lowercase. The $700 million retail-residential complex is the largest development in the history of the university and the largest in the history of South Los Angeles. The building with the spire on it is Leavey Honors Hall (formally the Thomas and Dorothy Leavey Foundation Honors Hall), which contains the McCarthy Honors College (formally the Kathleen L. McCarthy Honors College) and the Honors Residence Hall. The Leavey and McCarthy names are thanks to a gift from the Thomas and Dorothy Leavey Foundation, chaired by USC Trustee Kathleen Leavey McCarthy (daughter of Thomas and Dorothy Leavey). In another building is the Ghada and Ray Irani Residential College on first reference, Irani College thereafter. The large public space anchored by the statue of Hecuba, queen of Troy is the central piazza. The large grassy area on the village’s northwest side, which McClintock Avenue wraps around, is the Great Lawn. The lawn at the corner of Jefferson Boulevard and McClintock Avenue, where the Bank of America used to be, doesn’t have a name yet. Although the logo uses the ampersand, the word “and” is spelled out in most uses so that will be our style. Lowercase in keeping with AP style change of June 1, 2016. The word website is written as one word with a lowercase w.
In most cases, do not include “https://” or “www.” However, there are some cases in which these are necessary, so it’s best to double-check the website addresses. The last forward slash is not needed in web addresses. These shortened names are used in “USC In the News” for brevity. In most cases, the expert should be identified according to the school he or she is with, not by the institute. Exceptions include experts employed only by an institute or center, or by institutes that are joint projects evenly divided between two schools (e.g., the USC Lusk Center for Real Estate). If in doubt, check USC in the News online to see how we have identified that expert in the past. The name of USC’s alumni magazine is USC Trojan Family Magazine, not Trojan Family Magazine. When referring to USC Trojan Family Magazine issues, write Spring 2012 or Autumn 2012 (capitalize with no comma before the year). The most important thing is consistency within the issue. Follow the list provided in the USC Style Guide. The school should be written without periods: LAS, ARC, SCA, DEN, ENG, SFA and follows the appropriate graduation year and is contained in parenthesis. If the person received multiple degrees from the same school, then the school abbreviation follows the last degree and graduation year listed. Marguerite Sadler ’83 (LAS), JD ’86 (LAW) was recently promoted to senior vice president and corporate counsel at Club Holdings LLC. Jane Doe MA ’12, PhD ’12 (LAS) is currently serving as executive director of Alpha Academy. Under the appropriate graduation decade, enter the person’s name in bold, type of degree(s) only if it’s anything other than a bachelor’s, degree year(s), school affiliation in parenthesis, followed by the announcement. NEVER put periods in between the letters if the degree is listed alone, not next to a name (see Academic Degrees). For ex. “Doris Smith graduated with her MA in 2000 then decided to pursue a DDS. If a person has multiple degrees, separate by commas and type the degree followed by the year. Clyde Cronkhite MPA ’73, DPA ’91 (SPP) published the book Criminal Justice Administration: Strategies for the 21st Century. -Include the school the person graduated from in parenthesis after the appropriate graduation year listed (see School Abbreviation). -If a woman gives her maiden name, put it in parentheses between the first and last name, or middle initial/name (if provided) and last name. -Nicknames (if given) go in quotes between the first and last name, or first name and middle initial/name (if provided). -Try to make each entry as concise but descriptive as possible. Give a brief description of the company/business the person works for if it’s not very well known. If a person is given an award, mention the organization that gave the award. Provide brief descriptions (genre, five-word summary, etc.) of any books people write. -Norman C. Bitter DDS of Fresno, Calif., published …. -Joseph Rivera EdD was re-elected as a governing board member of the El Rancho Unified School District in Pico Rivera, Calif.
-Jeff Lenning had an article on application servers published by the Journal of Accountancy. He lives in Irvine, Calif.
-Bold the name of all alumni that are mentioned in each class note and include their class year. -Same format/method for listing names and degrees as Class Notes. Only put alumni names in bold; if their spouses did not go to USC, do not bold their names. -Only put a period at the very end of the marriage announcement section—not after each individual announcement. -Arrange all birth announcements chronologically by graduation year. If both people in the announcement graduated in the same year, put the woman’s name first. Include the school the person graduated from in parenthesis after the appropriate graduation year listed (see School Abbreviation). – Only put a period at the very end of the birth announcement section—not after each individual announcement. Do, however, put a period at the end of each sentence within the individual announcement; but don’t put a period at the end of the last sentence in the individual announcement. – Treat adoptions in the same way as you treat births. Don’t specify anywhere in the announcement that it’s an adoption. -Non-alumni go at the end of the obit section under subhead “Faculty, Staff & Friends,” and are listed in alphabetical order. Non-alumni are classified into three groups: those who attended USC, but did not graduate nor receive a degree; those who donated a monetary gift to the university; and those who served as a member of the Board of Trustees. Oftentimes, an alum also was a USC faculty/staff/friend. In those cases, place obituary under “Faculty, Staff & Friends” and include the graduation year(s), degree(s) and school affiliation. -Only put a period at the very end of the “In Memoriam” section – not after each individual announcement. (web version) Each obit should include the above – Alumni Name [year/degree], of [City/Town, State]; [date of death], of [cause of death], at the age of [age]. -General Notes: It is extremely important that you type all names exactly as they were given to us – even if it breaks our normal style. This goes for the deceased and all names of the family members. This can be a very touchy subject among the family. Also, check, double-check and triple-check all information you’re including in the obits. It can be extremely upsetting to the family if any piece of information is wrong – especially things like misspellings of family names, omissions of certain relatives etc.